Who is Afraid of Donald Trump? The “Left” Sides with Hillary? Against the backdrop of the numerous discussions of the political agenda, appearance, and vocabulary of the candidates running in the American presidential election, there is practically no demand for one topic: what is the class nature and mass social base of each politician? This approach seems quite natural for the right-wing and liberal media, but why is this topic completely alien to the left? The reason seems to be that the answers we would get if we consider this issue seriously will not be palatable for everyone on the left. For many American intellectuals, the provocative and politically incorrect statements by Donald Trump have become another ideological excuse allowing these intellectuals to express a “critical support” for the existing order, embodied in Hillary Clinton. The fact that Hillary is the candidate of financial capital and that she intends to carry out an extremely aggressive foreign policy is not a secret to anyone. But all this is much less important than political correctness. After all, Hillary never allows herself to make statements insulting any minority, or rather, not in the past two decades, when political correctness became a norm of conduct in Washington. Against this backdrop, the accusations of Donald Trump of “fascism” have become a constant refrain of the Clinton campaign. Paradoxically, these accusations are not directed against Trump himself, but rather against Bernie Sanders and his supporters. Since Trump is the “absolute evil”, everyone should unite around the “lesser evil” represented by Hillary, while the senator from Vermont, who stands in the way of this consolidation, has to leave the scene. It is telling that such sentiment is expressed not only by the well-known economist Paul Krugman, who suddenly forgot all of his harsh statements condemning the neo-liberal policies, put in place by Democrats, but also by Noam Chomsky, who is undoubtedly a moral authority for the left. The difference between Krugman and Chomsky is, of course, enormous. The first is clearly hoping for a post in the new administration. His aggressive attack on Sanders’ campaign and its supporters have already caused a scandal and undermined the reputation of the economist. Chomsky, on the contrary, constantly expresses his respect and sympathy for Sanders, but reiterates that in the name of the fight against Trump will have to support Clinton, no matter how disgusting her policies are, and no matter how horrible would be the consequences of such choice. In fact, the discussion is about how to maintain and increase current dominant evil for the sake of preventing certain, hypothetical evil, about which we do not know anything other than we ourselves have declared it to be something obviously worse. The point is not only the moral side of the issue. 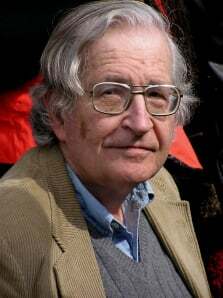 Critically-minded intellectuals have largely turned into hostages of the existing system, and not just institutionally, since they are part of the system one way or another, but what is far worse, intellectually. While proclaiming the utopias and “alternatives”, they are not able to think in terms of practical politics, and realize that breaking with the established order of things involves risk, drama and challenges that require a significant courage. The intellectual and moral comfort is guaranteed by practical conservatism that people hide from themselves, repeating meaningless “progressive” mantras. At the time when the intellectual elite left is confused and divided, the sectarian groups on the left just try to ignore what is happening, proclaiming there is no difference between the two candidates running in the Democratic primary. However, it is not by chance that the Democratic Party leadership is doing everything possible to block the Bernie Sanders’ campaign despite the fact that according to the polls he looks much more attractive as a candidate in the fight against Trump. And the Republican machine also actively fought against Trump, though with less success: they were unable or unwilling to apply the methods of “foul play” to which their colleagues and rivals from the Democratic Party resorted. It is impossible to explain what is happening solely by the machinations conducted by Hillary who is doing whatever it takes to become a US president. The story with the “mysterious” transcripts of remarks made by Mrs. Clinton to the leadership of Goldman Sachs gives us some clues which help to understand what is going on. Despite the fact that the refusal to publish the text of the speech inflicts a serious blow to her reputation, and is constantly used by her opponents, she steadfastly refused to do so. Obviously, the content of the transcripts is so compromising, that it is better to lose votes because of the refusal to disclose the document, than to lose any chance of victory in the event of publication. However, information about the contents of the transcript gradually seeps into the press. Employees of Goldman Sachs, who were present at the presentation, say that the former first lady actually discussed with the bankers, how they will divide the national budget together. Although Goldman Sachs has long been engaged in this directly or indirectly by receiving considerable public funds (regardless of who is in power – Democrats or Republicans), public recognition of such collusion, especially held in advance, can not only ruin the reputation of candidate, but also harm the bank. It seems Clinton is worried about it, no less than about her own political future. Transcripts of remarks to Goldman Sachs represent the real political program of, not only Clinton, but also all the current Washington establishment regardless of the party differences. However, both Clinton opponents are not related to the financial capital, and, in case of victory, undoubtedly will try to limit, if not stop the “distribution” of national funds due to which major banks flourish amid the economic crisis. Sanders became famous a few years ago when he organized an audit of the Federal Reserve System, to find out how almost 13 trillion dollars of unaccounted money went through the “gray” schemes to the interested American banks. Trump, who expresses the interests of the construction business and industrial capital, is interested to force the bankers to lend to the domestic production at a low interest rate, and for this it is necessary to put an end to the current policy when the money given to the banks by the state end up in the speculative markets. The class meaning of the struggle is clear. If Sanders could, perhaps for the first time in US history, form a Socialist-Democratic Bloc of employees, uniting the working class with the angry young middle class, Trump headed a rebellion of the industrial bourgeoisie against the financial capital, also with the support of a large section of the workers. The only difference is that in the case of Sanders, we see movement based on class (horizontal) solidarity, while Trump offers corporate solidarity (vertical). This situation is quite natural for the working class, which not only has common social interests, but is embedded in the system of vocational and industrial relations, which makes it, in certain situations, support certain groups of the bourgeoisie, related to the working class by virtue of corporate production and market logic. From the standpoint of the left ideology, the first option of solidarity is progressive, while the second reactionary. But both of these uprisings are still dangerous in the eyes of the financial capital. We are talking about blocking of cash flow of billions of dollars, which allows banks and their bribed politicians to exist parasitically at the expense of the real economy. Clinton’s policy is a classic example of splitting society into numerous interest groups, preventing the horizontal integration. It is not a coincidence that the crisis of the labor movement and class politics which is currently happening in the Western world is going along celebration of multiculturalism and political correctness. And the spread of political correctness, in turn, historically coincide with the “financialization” of the economy, in other words a massive redistribution of resources in favor of the banking sector. On the one hand, the capital triumphed over the labor, robbed it of a significant part of the social gains of the twentieth century. But on the other hand, the capitalist class had its own redistribution of wealth, and the financial elite have appropriated nearly all the fruits of this victory. It is not surprising that in this situation we see a rise of not only the working class, but also a part of the bourgeoisie. And Trump attacks against political correctness are by no means a manifestation of his personal feelings, his unrestraint and rudeness; it’s a conscious strategy to consolidate those social groups that have suffered under the dictatorship of political correctness. They were hit practically and financially; they lost their income, jobs and revenues. Trump’s propaganda is quite rational, and it is effective not because it, as the intellectuals think, resonates with the feelings and prejudices of the people, but because it reflects their real interests, even if expressed in a distorted form. The billionaire only bullies the groups which will not vote for him anyway. But it consolidates the voices of millions of white (and actually not just white) working class people, who are mortally tired of political correctness. And even those Trump statements, which seem to many quite ridiculous and anecdotal, such as the promise to build a wall to fence off Mexico, in fact, are not. After all, if building the wall will really start, it will create hundreds of thousands of jobs, not only in the US but also on the opposite side of the border. In fact, this is another Keynesian project, albeit fairly absurd from the standpoint of ordinary logic. And therefore Trump statement that Mexico will finance the wall is not unfounded. For the economy of its northern states such a project will not be just profitable, but saving. It will not stop the illegal migration from the other side of the border, of course, but it will create incentives for the development of production in the region, whose livelihood is currently dependent mainly on drug trafficking and illegal migration. The story is more complicated with the offensive remarks regarding women. On the one hand, it really causes indignation among educated white Americans, who are used to a completely different attitude. But on the other hand, the question arises: would these women vote for him, even if Donald showed more tact? At the same time, despite these statements (or even possibly because of them), bully Trump is gaining a reputation of a “real man”, rough, but sincere, the one you can rely on and the one you can be attracted to, among the women belonging to the less educated part of society. Of course, there is nothing progressive in Trump’s ideology. But this is not about ideology, which today serves not so much as a factor of social mobilization, but as a tool for manipulation. The defeat of financial capital, no matter who brings it about, opens a new era in the development of the Western society, and would inevitably create conditions for strengthening the position of the working class and the revival of its organizations. In other words, it is Hillary who embodies the most reactionary project in the framework of modern capitalist development. And the unwillingness of Bernie supporters to vote for it, if the Socialist candidate quits, is not just emotional, but is entirely rational – politically, socially and morally. In the context of the current political situation the attempt to turn Trump into “an absolute evil” is nothing more than an attempt to mobilize people to protect the status quo for the sake of preventing any change. But change is underway, not only because of the political and social logic, but also due to the fact that the possibility of maintaining the current neoliberal model of capitalism is objectively exhausted. And if the left does not want and cannot fight it, it will be the right-wing populists like Donald Trump in the USA or Marine Le Pen in France who will strike the fatal blow to this order. In this case, it will be possible, of course, to get outraged at the “prejudice” and ” irresponsibility” of the working class , but the real moral responsibility still lies on the leftist intellectuals themselves, who, in times of crisis, have demonstrated their class position, by acting, in fact, as advocates of ideas and defenders the interests of the financial capital.